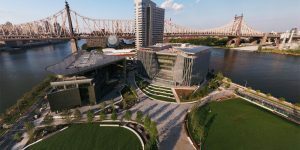 The Cornell Johnson Executive MBA in Metro NY is a 60-credit, four-term, 22-month program beginning in July. While every term begins with a week-long residency at the Ithaca campus, classes during the duration of the terms take place every other weekend (Saturdays and Sundays) at the HNA Palisades Premier Conference Center in the Palisades, New York. Round-trip shuttle services are provided for travel between the Palisades and Manhattan. Core coursework is completed in the first year of the program, with “advanced and strategic coursework,” according to Cornell, concluding in the second year. Students primarily explore two themes in coursework: innovation and global experience. Students are offered electives beginning during the winter residential sessions, with each student completing three elective courses out of a possible ten. The Executive MBA Metro NY Class at Cornell features 70 students that are around 36-years old. About 27 percent of the class is made up of female students. Current tuition for the Cornell Executive MBA in NY is $182,708, with terms subject to change up on the new academic year. Summer terms are currently priced at $15,000, with non-summer terms coming at $36,526. Before traditional submission, applicants are expected to complete a pre-assessment to review if they are possible fits for the program.